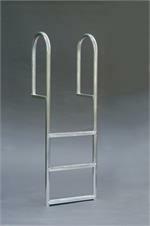 Boat Dock Ladders - Innovative Design, Long Lasting, Maximum Strength. The sturdy, space saving design of our aluminum marine dock ladders make them the perfect choice for getting in and out of the water. These boat dock ladders are constructed from 6063 T5 Marine Grade Aluminum, from 1.25'' and 1.5'' pipe and TIG welded for maximum strength. 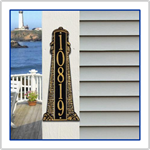 The dock ladder rungs are extruded with grooves to provide sure footing and reduce slippage. These dock ladders are ideal for fresh and salt water applications and can be used on swim floats, boat docks and seawalls. All of our boat dock ladders have a 500 lb. capacity. The Straight Boat Dock Ladder, perfect for seawalls and stationary docks with fluctuating water lines, makes climbing in and out of the water a breeze. The variety of lengths will accommodate most installations. 14 inch diameter handrail. The Lift Boat Dock Ladder is an innovative, retractable ladder featuring a new and improved heavy-duty rung hangar (Patent No. 6,422,530). 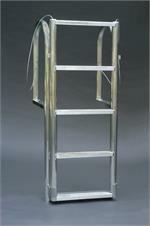 To extend the life of the ladder, simply pull up the lower section above the water line to eliminate marine growth.